Riverside, California, once known for a thriving real estate industry, was hit hard by the economic crisis of 2008. As more residents became dependent on soup kitchens and food bank use increased, lack of access to fresh local produce in the community became starkly apparent, despite the fact that the city is surrounded by thousands of acres of agricultural land. That’s when UC Riverside graduate Fortino Morales convened fellow students to find space on the campus of University of California at Riverside for a community garden. Through the persistence of student volunteers, UC Riverside is now home to a three-acre community garden that isn’t only growing fresh food, it is growing converts to a Riverside local food movement. A pilot garden began in 2009 as a partnership between the students, the college and the local Salvation Army that was looking for a source of local fresh food for its clients. After several hurdles and changes in administration, the UC Riverside Community Garden has secured land and funding for four years. Morales holds a full time staff position at UC Riverside where he oversees the many projects and innovations taking place in this campus public space. Agriculture-based education for students and the public is a foundational mission for the garden. UC Riverside students designed a gardening seminar to take place at the community garden, devising the syllabus and assignments and lining up speakers to share their knowledge of agriculture. For many Southern Californian students who grew up in an urban setting, the seminar is an opportunity to reconnect with nature and food. The garden also offers a staff wellness program to help reconnect campus faculty to nature and healthy living. The community garden grows seasonal fruits, vegetables, flowers and fruit trees. 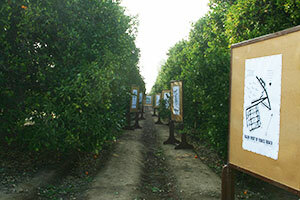 An acre of the garden is dedicated to growing Valencia oranges, which are harvested and donated to area nonprofits to promote the local food movement. In April, the student gardeners planted donated gladiolas to attract pollinators. Morales hopes they will be blooming just in time for graduation. “The cool thing is that students, faculty and staff from across disciplines are interested in the garden and sustainable food systems,” says Morales. Women’s studies and engineering students join botany and environmental science students on work service days in the garden and the local Master Gardener’s Association uses the space for workshops. The Native American club on campus recently received grant money to purchase seeds important to their culture and history. Currently, the garden is working on the installation of seating, a gazebo and a composting toilet bathroom all made from an earthen material blended in a cement mixer and poured into custom made forms. Students from the engineering department helped with the design. Cross-campus partnerships present marketing and teaching opportunities for the garden. UC Riverside’s dining staff requested students grow several vegetables for use in the dining hall. Composting materials come from campus dining as volunteers sort compostable waste from leftovers and dehydrate the food to reduce its weight. Campus interns bike the dehydrated compost to the garden three times a week. Another campus partnership with the engineering department has created a mobile generator for the community garden. “It’s a Mobile Renewable Energy Generator,” says Morales. Comprised of eight solar panels and eight batteries connected to a 8 x 19-foot trailer, the MREG helps create a more sustainable garden. “It supplies all the electricity we need for the garden such as power tools, lighting and music,” says Morales. Community outreach is core to UC Riverside Community Garden’s mission. Students are currently preparing a new drip irrigation system for the area designated for community allotments. Morales publicizes local food events on the Community Garden’s website and student volunteers spend time on the six area community gardens sharing tools and agriculture knowledge. Approximately a year and a half into their four years of guaranteed funding, Morales is always thinking about the way forward for this campus-based, community-focused garden. Future plans include a community CSA to create a sustainable funding source. Morales seeks grant funding for equipment and materials and is always accepting donations in the form of plants and trees. A few donated fruit trees would help the garden with shade issues and increase the amount of harvest for donation.